Click here to download a sample schedule of our Two week PDC program: EDT 11.pages. With Doug Crouch’s seven plus years of facilitation experience in PDC’s globally combined with ecological systems management for 15 years, the TreeYo schedule is a reflection of our original intention and leverages this lengthy experience. It has always been an evolution as our openness to new techniques and student feedback allows for change as we work with a diverse team of teachers and host sites. This has allowed us to refine and define a great course which continues to be successful at manifesting change, internally and externally, creating lasting empowerment. Students are now teachers, students are now farmers, and students are now green business owners to name just a few of the paths that people have set upon to be producers. The cycle is coming full circle as many students are now even guest teaching with us as to stay connected with the TreeYo network. Thankfully we continue to receive very good feedback and we are happy to go higher with this journey to make a wonderful education experience for all involved. For the PDC itself, we employ a daily schedule very similar to most other two week courses as we employ four main class times during the day and one evening lesson on occasion. The evening sections are usually focused more on movies and/or presentations but also we try and provide space for the musical arts or some sort of organic sharing to take over. Our breaks at lunch are long, giving time for a siesta or other personal steps to recharge energetically. This aids in preparation for the group design projects during the following week and of course the lifelong journey of learning about the broad field of knowledge known as Permaculture. 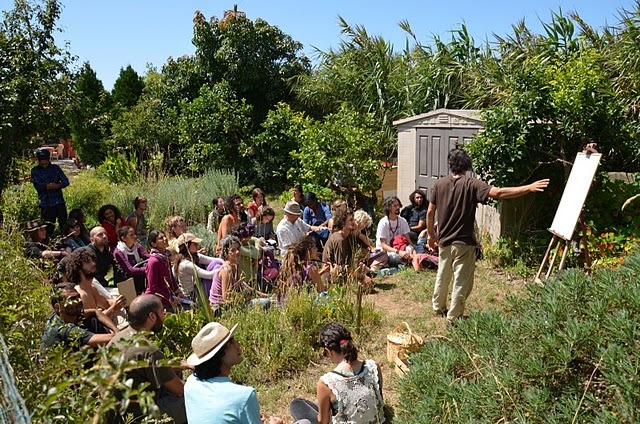 The course starts with community building exercises to demonstrate the intertwining of patterns of ecology and principles of permaculture. 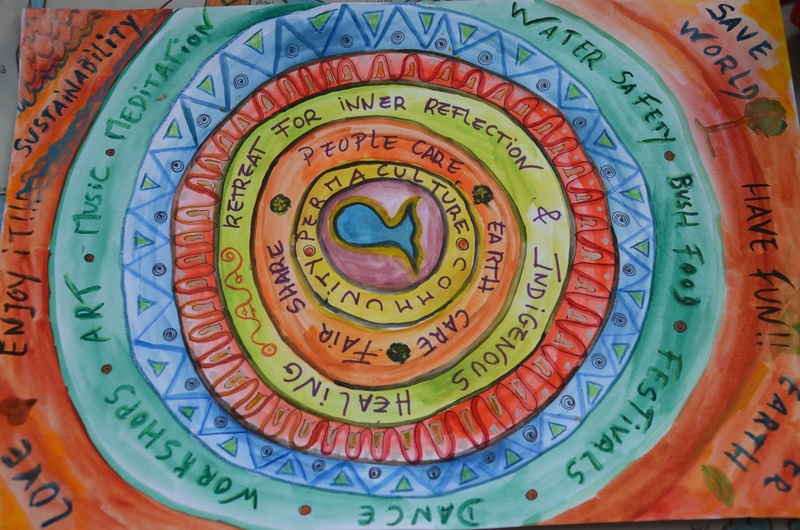 That is a perfect lead into the base of the movement known as the Principles of Permaculture. We have decided to model these first days after Mollison’s principles with the acknowledgment of all the other contributors. A concise version of the principles are laid out in his book Introduction to Permaculture as he smartly refined the second and third chapters of the Designers Manual there. We choose to spend extra time on these first chapters as we believe it sets the foundation for the creative use of design based on how nature works. We use several review exercises to directly apply the theory to design allowing the lessons immediate reinforcement. from the host site through site walk-and-talk and often will go for a field trip as well. 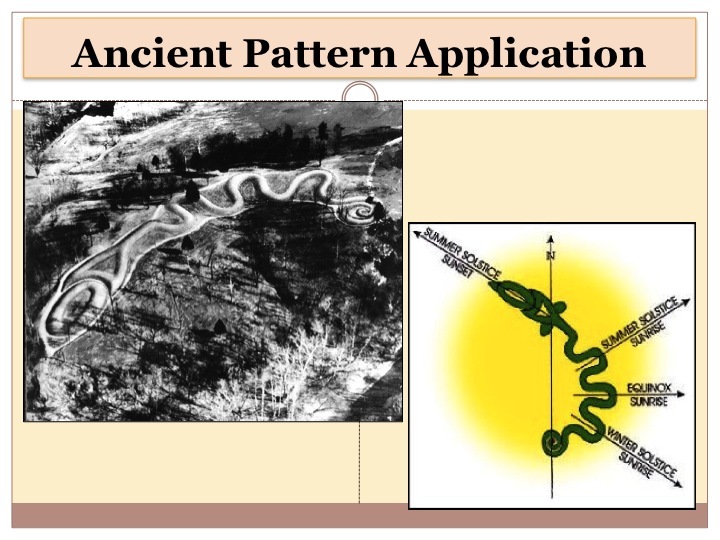 An additional course highlight is the exploration of patterns, which is highly enlightening for connecting to Nature and a distinguishing characteristic of permaculture from other land based design systems like landscape architecture. Usually on this same night we have a fun night called student presentations where students get a chance to share about projects they are involved with currently or are planning. This is a great networking experience that further brings the group together. By the end of the week, we get into the trinity of soil, water, and trees and how they are all inextricably interrelated. 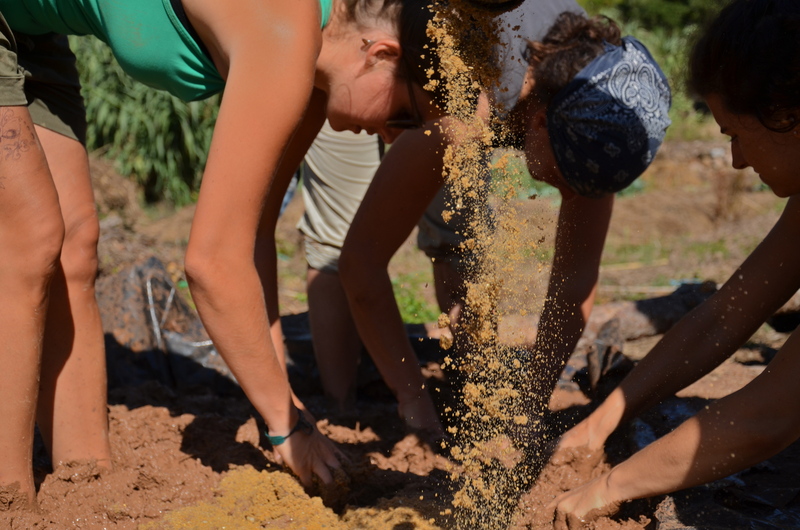 From the principles, the common Permaculture development pattern encapsulates these topics setting the stage for the following weeks look at earthworks and the creative integration of humans amongst other topics. 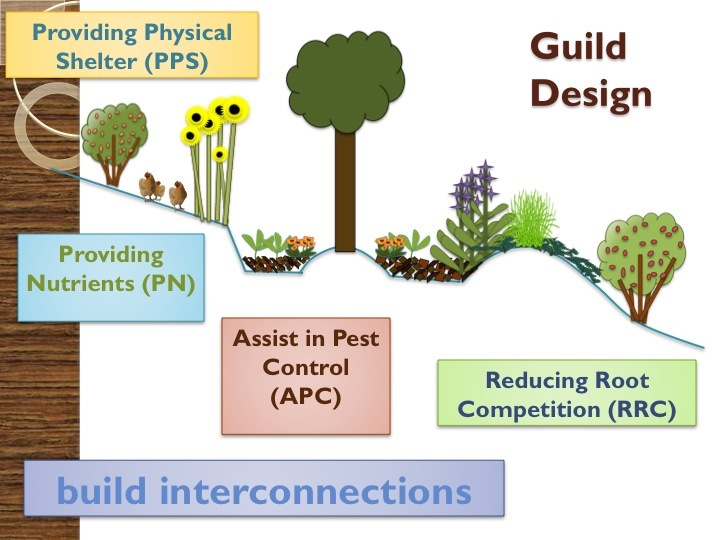 Week Two goes deeper into the “pattern to details” approach that permaculture design utilizes and our direct application of the science itself to the course layout. Finishing soil, water, trees and earthworks allows us to look at context dependent designs further. Thus we delve into the different ecosystems of the world and how the designs differ for each climate. Even more details emerge in the sections focused on aquaculture as well as the social/economic side of all of this. The second week also has hands-on with earthworks, natural building, and other fun site design installations like herb spirals or circle gardens. All the while we keep an eye on our hot compost pile, ferments, and focus on the big hands-on activity of the group final design projects. groups for 35 minutes depending on the group size. That evening, and the course itself, culminates in the no-talent show, which is a way to celebrate the course and recap some of the material at the same time. We highly encourage costumes and complete silliness. 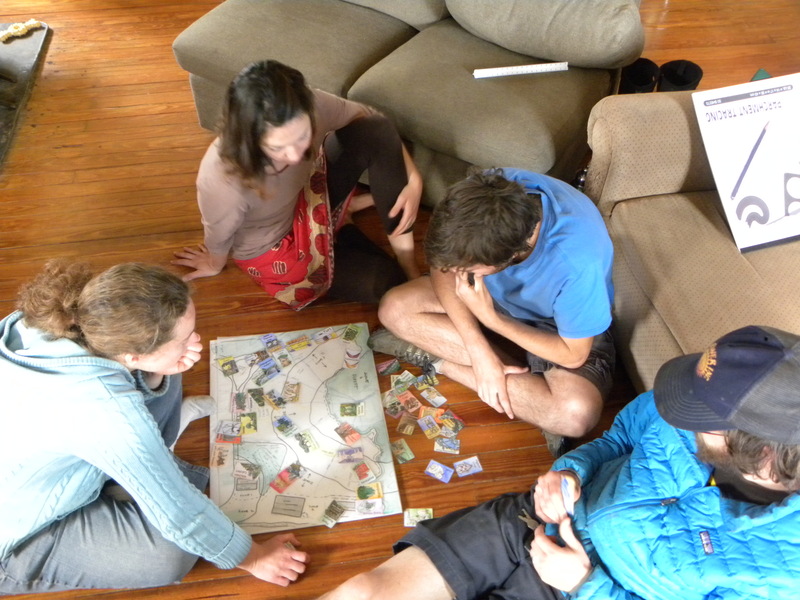 The last morning is when you receive your design certificate and we discuss how to move forward into the Permaculture world. It is a big wave to ride and we try and support as much as possible for people to feel good and integrate the learning. The schedule is an ever-evolving entity because we are always re-evaluating to utilize any opportunity to improve our curriculum. We also recognize the uniqueness of each site (due to factors such as culture, climate, and resources) and adjust the schedule accordingly. Overall we feel it is the most accurate portrayal of the curriculum that Bill wanted all the while integrated with new school learning techniques to accommodate different learning styles. In the end we want people to connect with their newfound community, draw inspiration from Nature, and have some fun doing it.